Concrete & Deck Restoration Inc.
Driveways, Walkways, Garages, Patios, Steps and Walls, Pool Decks and Interior Flooring. You've got concrete inside and outside your home or business. It's on your driveway, your sidewalk, your patio, your garage, your showroom. It's everywhere! Concrete can take on the look of tile, marble, granite, brick or any natural stone with our color-integrated, modified acrylic spray cement system. We offer a wide selection of colors, texture, and patterns that gives your home that unique, custom look. Today, concrete is looked at as more than simply a raw material...it's also decorative. Enhance the beauty of your home and in the process increase your property value. A concrete designer from our trained and experienced staff will bring samples to your home or business and answer any questions you may have. The award winning Navigator software allows you to view the area before and after the system is installed. We will measure the areas being considered and then provide you with a free estimate and no obligation. With today's advanced materials, CDRI (Concrete and Deck Restoration Inc) is creating an endless array of beautiful surfaces that are the ultimate in durability and elegance. 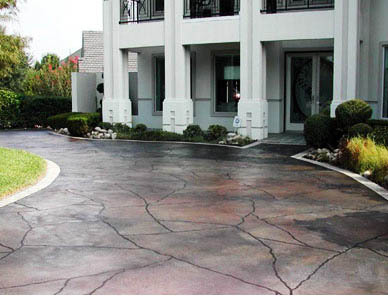 Old, out-dated, or new surfaces can be effectively and economically transformed to the look of your choice. Our job is to provide customers with new options to achieve the look they desire, do so in a cost-effective manner and achieve the durability and beauty they seek. We offer a look along with a warranty that is unmatched when compared to any other product or service available today. Both inside the home and out, the CDRI Concrete System we have chosen can beautify and protect at twice the strength of concrete. Being more durable than conventional products, just imagine what it can do for both your interior and exterior areas around your home. We will be a leader in the concrete repair, restoration and beautification business by remaining on the cutting edge of technology and material science. We will use only the finest products and deliver the highest level of workmanship to each and every customer we service. Copyright © 2008 Concrete and Deck Restoration Inc. Crystal Lake, Illinois, U.S.A.